An unschooler and museum education professional explores free-choice learning, discovery, and a revolution of the education system. I was listening to the Diane Rehm show on NPR the other day, and the discussion topic was how people think, especially in this age filled with distractions. Here is the link to that show and some of the highlights. The guest on the show had some really interesting points about technology, how we use it, and how a culture's approach to learning tends to evolve over time. As a complete philosophy nerd, I was enthralled by this conversation. It got me thinking about the educational theory I spent so much time studying this fall. Most school systems use the didactic model; information is conveyed from teacher to student incrementally, with the teacher being active and the student a passive receiver. Knowledge is assumed to be in concise "bits" that are added into the brain, and learning is thought of as a simple adding process. Constructivism, on the other hand, begins with the idea that knowledge exists only when it is created inside the mind. Learning is the process of actively making meanings and ideas, which is constantly restructuring the brain. The constructivist model can be daunting for a teacher, because you never know what meanings and ideas your "student" is going to create, and therefore you can't predict what the endpoint or "result" of the learning will be. I personally LOVE this way of learning; it is pretty much how my brain has worked my entire life. However, as a teacher I find myself falling back into the didactic format because I have points I want my students to "get", and the easiest way to do that is to simply tell them. The guest on the Diane Rehm show that day was talking about how the currently available technologies have made it possible to simply retrieve information from another source, rather than needing to keep quite so much in our brains. One possible consequence of this focus on retrieval is an avoidance of critical thinking, since "getting the answer" is so much faster and easier than problem-solving it out with our minds. Some people have expressed a concern that young students today are not learning how to think critically because there is usually an "answer" that they can find. This tendency embodies the didactic theory of knowledge, that it exists as "bits" of absolute information that simply must be retrieved when necessary. Yet we know that the world and the issues plaguing it are more complicated than such a black-and-white model. We can understand the future may be best figured out by people who can practice divergent thinking and create new meanings and ideas from primary input. Essentially, constructivist thinking (and learning) is a way to solve complex problems that do not have a concrete or straightforward "answer" but several possible solutions. Those constructivist, unpredictable and sometimes even unintended outcomes can feel scary at first, since you never know where you are going to end up (as the teacher or the student!). But the thinking itself exercises our brains in a way that is quite invigorating. Do you ever catch yourself doing that? I absolutely love learning. You could almost say I'm addicted to it, actually. I never get enough of discovery and new experiences and the epiphanies that go along with them. At this moment I am halfway finished with my MAT in Museum Education, which means that in seven months I will be entering the workforce. I suppose the only thing that will change at that point will be that I will (hopefully!) be getting paid to learn, rather than paying tuition for my education. I can't imagine a more exciting career than one in which I get to learn by teaching and spread discovery every single day. 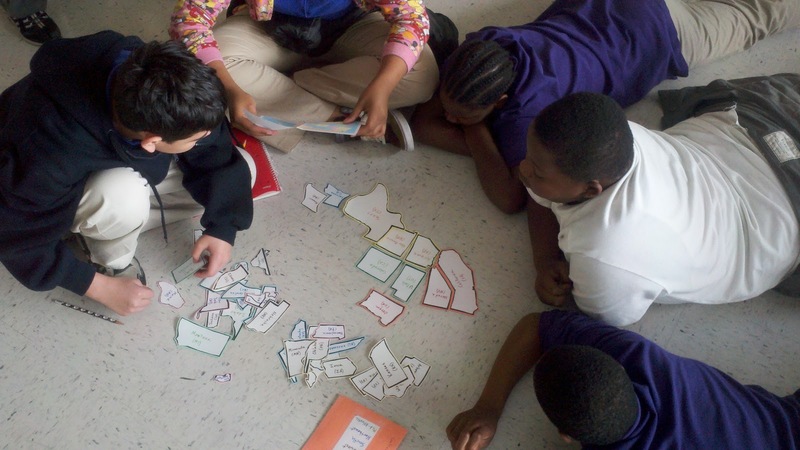 Seventh-grade students learning the states with a paper puzzle I made for them. I just finished a semester-long internship at a public middle school in Washington D.C. My absolute favorite day there is shown in the picture above; my students were learning the geography of the continental U.S., so I made them a paper puzzle of the states. On that day I handed them the puzzle and a labeled map of the continent, then sat back and allowed them to work it out together. They collaborated, one reading the map, several others finding the right pieces and moving them into place. Everyone participated. There was no arguing or distraction, everyone was incredibly focused. As they fit the pieces together, sometimes they would note that a relative or friend lived in that state, and we would talk about it. The kids shared stories, memories of trips, or details about their out-or-town family members. The conversation evolved to local traditions involving food, culture, history, and politics. When I looked at the clock as told the kids it was past the time for them to go down to lunch, they said, "no, we want to stay and learn more!" It was amazing, and it still uplifts me to remember it. I try to think back to that day whenever I'm planning other educational programs. The beauty of that exercise was that the kids owned it; they were the ones running the activity, it was hands-on and engaging, and their personal connections to the subject matter made it relevant to their lives. Each discovery of a state name or location led to stories or memories, which led on to more questions and eventually new discoveries. It's infectious, and it quickly snowballs into an energetic and positive experience when you get it right. I'm continuously looking for more ways to make that happen. I bring together science and creative arts to develop interactive, multi-sensory learning experiences.